Hey gals, thank you so much for all the lovely comments. I'm doing good and even gained weight. I didn't weight myself for quite sometime and only realize I've put on so much weight when I try to put on the new pants I got for myself when I was holidaying in Hanoi last December. After back from Hanoi, I wash and keep the pant for CNY. All the clothes I bought from Vietnam I will wash them first before wearing it. It was very dusty there. On the first day of CNY, I take out the pant to match them with my new blouse I bought and do you believe that I can't even button it. It was about 2 inch apart. I've put on 5kg,..arhhh!!! I promise myself to on diet after CNY. How can I resist all those sinful food right?? lol ~ Most of my friends they don't even realize I've put on so much weight. Maybe it's because I'm tall. I just hope to get back my ideal weight and really watch out what I eat now. Okay, I don't want to bored all of you with my grumbling. Here goes the recipe I'm going to share today. 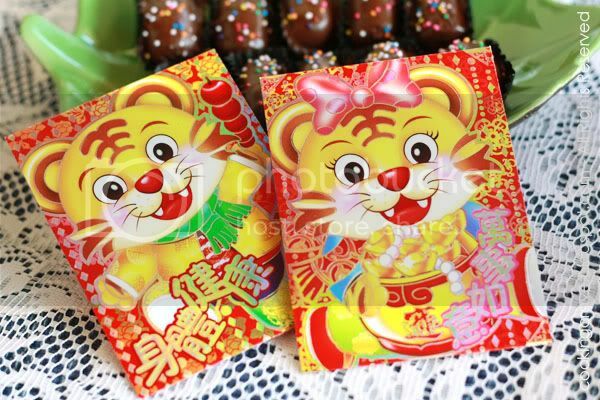 This is a must have for my kids when it comes to CNY. They love it so much. 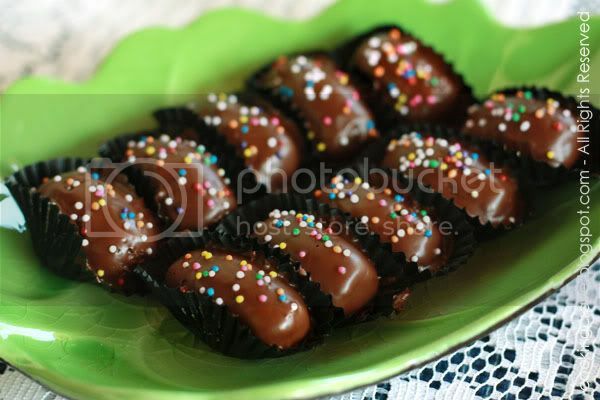 Yummy almond cookies coated in chocolate...who will say no to this?? TIGER Angpau's cover I got from Hong Kong. NICE? 1. Cream ingredients A till it's well combined. Mix in ingredients B to form soft dough. Wrap the dough with one whole almond and shape it into oval shape. Bake on the lined baking pan at 180c till golden brown. Remove and leave it to cool. Tip 1 : As I baked double the recipe, I kept the cool cookies in an air-tight container before coated them with melted chocolate the next day. Melt cooking chocolate with double boil method. Drop the cookies into the melted chocolate before pick it up with chopstick. Place the chocolate coated cookies onto the prepared paper cup. 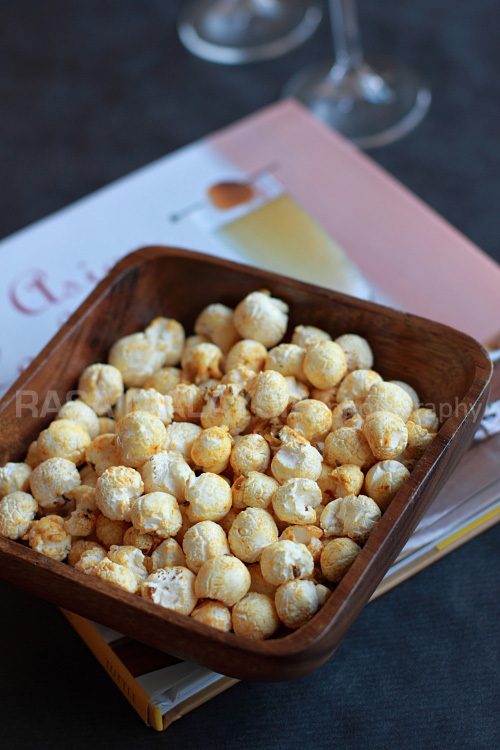 Arrange it on a tray and sprinkle it with the colourful sugar rice or toasted nibbed almond. Leave the chocolate to form at room temperature before storing them into the air-tight container. Tip 2 : DO NOT REFRIGERATE IT !!! From my experience, once we chill it in the fridge to set the chocolate the cookies won't last long when we took it out from fridge. The cookies will produce moisture and turn wet, it become chewy rather than crispy. The almond too will too turn soft. The worst is, the chocolate that have been put in the fridge will not set well when we take them out from the fridge. It will melts, I don't know why!! I think that's the "pantang larang" we have to bear in mind when making this cookies. PLS TAKE NOTE ok? This CNY, i did not bake this, too busy with Kuih Bangkit, hehehe..Looking forward more updates from you. These are my family's favorite, we go nuts for it!! Can't wait to see the recipe! In the meantime, keep it up! So colorful with the sprinkles on chocolate. Still got problem for uploading? Miss your post. i love that, so cute ! !